It’s easy to blend in when you’re in the city. In the country everyone knows everybody. It’s hard to carry out your subtle machinations among farmers. But in the city? There’s so much activity, so much bustle, that you can traverse dark alleyways without notice. There are plenty of places to hide, even in plain sight. There are plenty of people to plan with, plenty of people to backstab. And there are plenty of opportunities for you to make your way to the top. 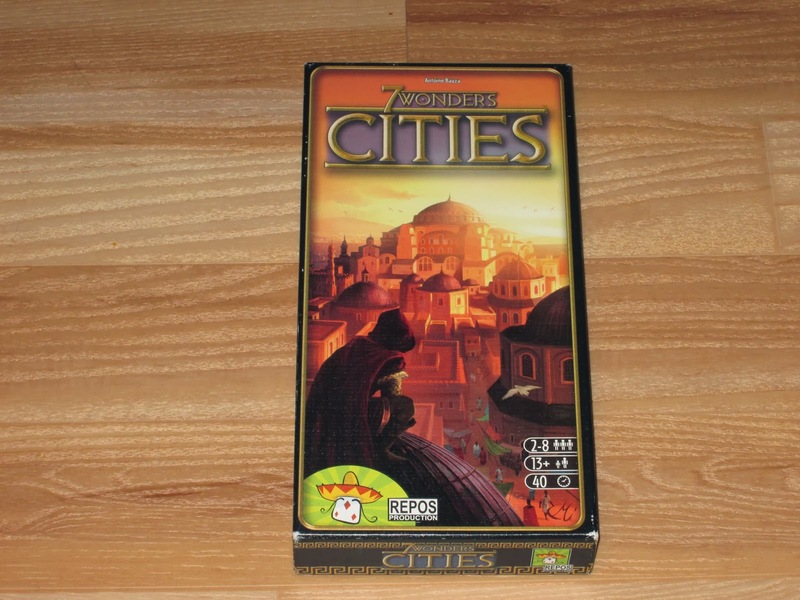 Cities is an expansion for 7 Wonders. The base game rules are largely the same, with a few new twists. First, the city cards themselves, which are black. 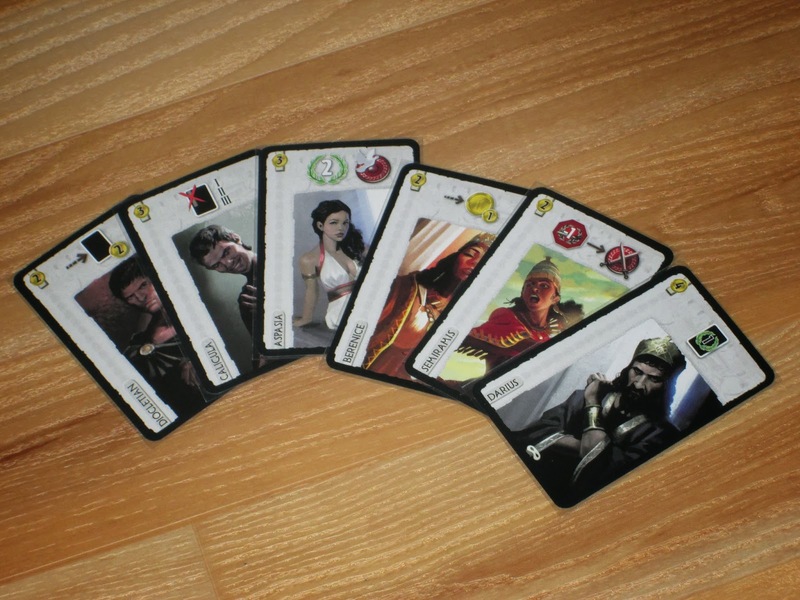 Each age has nine possible city cards, which are shuffled, and one random card is added to each age for each player in the game. 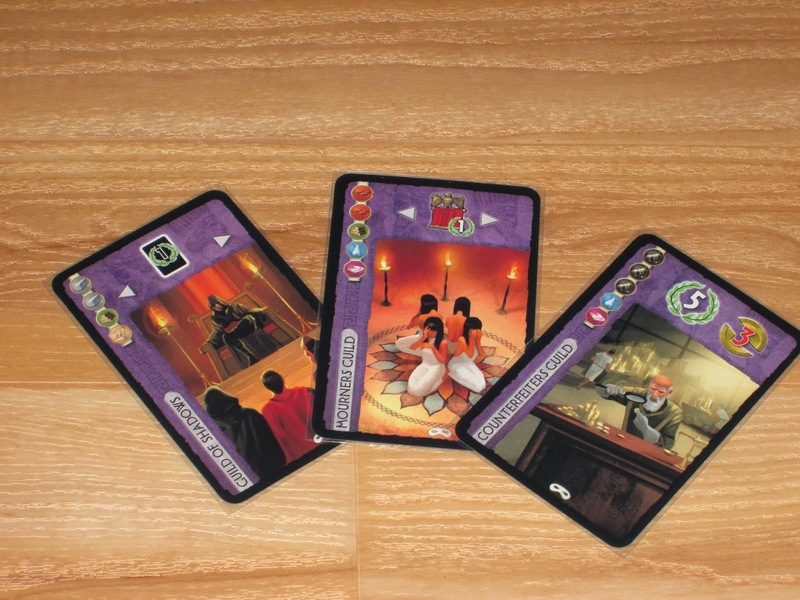 City cards generally add some underhanded or shady dealings to the game. Each age players will play seven cards instead of six. 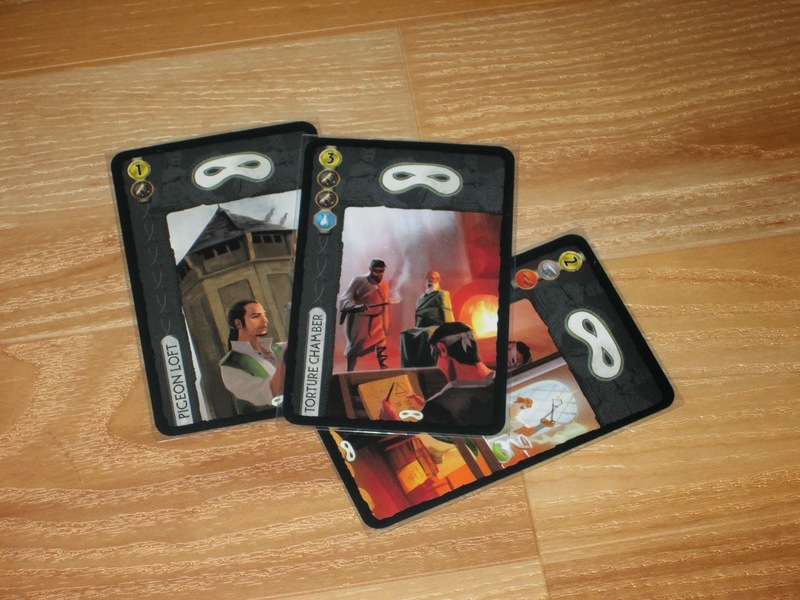 New concepts on the city cards include cards that force opponents to lose coins (and possibly go into debt, losing points), diplomacy (which allows players to sit out of military conflicts), spy cards (which allow players to copy science symbols from their neighbors), and mercenaries (which grant greater military strength than usually available for a greater price). Petra and Byzantium, the new wonders. 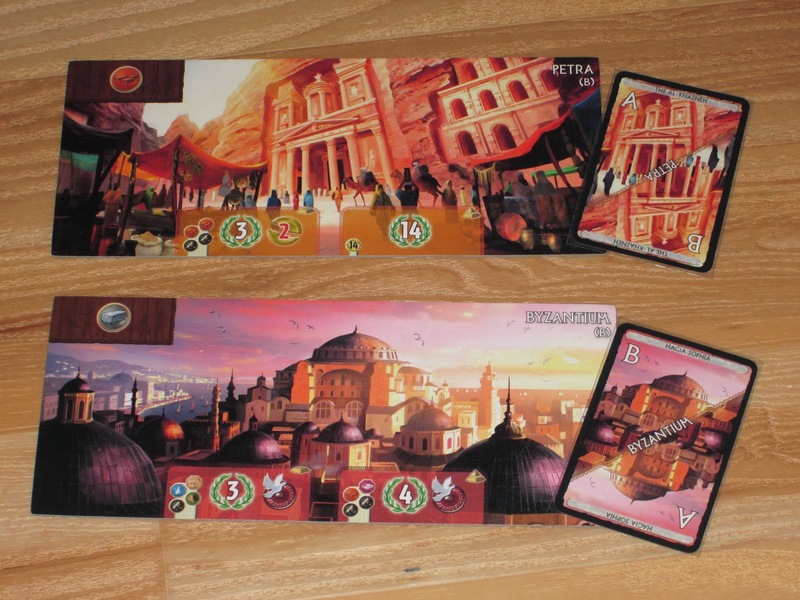 The game also includes two new wonders, Byzantium (which focuses on diplomacy) and Petra (which focuses on money), and rules for a team variant for up to eight players. In the team variant, teammates sit next to each other and may discuss the cards in their draft hands. At the end of each age, each player fights the non-teammate neighbor twice. Scores are added together, and whichever team has the highest total wins. That Great City, or Seedy Underbelly? In my review of the Leaders expansion, I called it good but not necessary to the 7 Wonders game, especially if playing with new or inexperienced players. While 7 Wonders packs a lot of game into its box and arguably no expansions are “necessary,” Cities comes much closer to the necessary expansion mark than its predecessor. I love it. What makes Cities excellent is the new concepts introduced. Most of them are not difficult, and the iconography is consistent, but they can alter the game in huge ways. The mercenary cards, for example, use the same symbols as other military cards–there are just more shield icons than would typically appear on that age’s cards, giving a player a leg up in the age’s military struggle. Debt is easily understandable: if you have to lose coins and don’t have coins to lose, you take debt for each coin you can’t pay. Simple. But it is no longer advisable to run your civilization on the edge of bankruptcy, making discarding cards a more attractive prospect than in the past. Spy cards help spread the science symbols a little more evenly by allowing players to copy the symbols of their neighbors. The only tricky concept in this expansion is diplomacy. 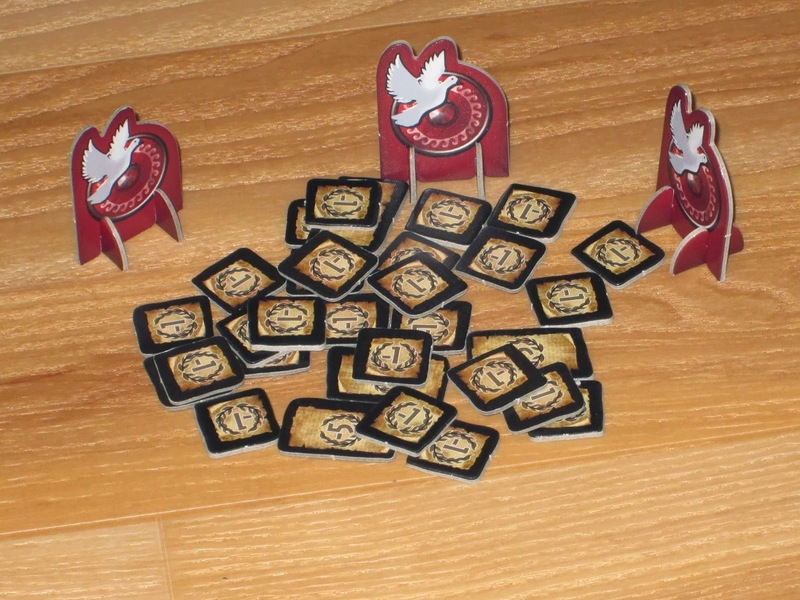 While the diplomacy tokens can be a bit difficult to explain, new players generally catch on quickly, and the twist they add to the game makes any labored explanation worthwhile. Players can potentially avoid military conflict altogether, forcing players who may not have been prepared to war with each other to fight. All of these aspects of the Cities expansion are game changers. They are a big deal, and players are wise to plan for them insofar as they are able. However, all of these are things that may be included in the game, but not necessarily. 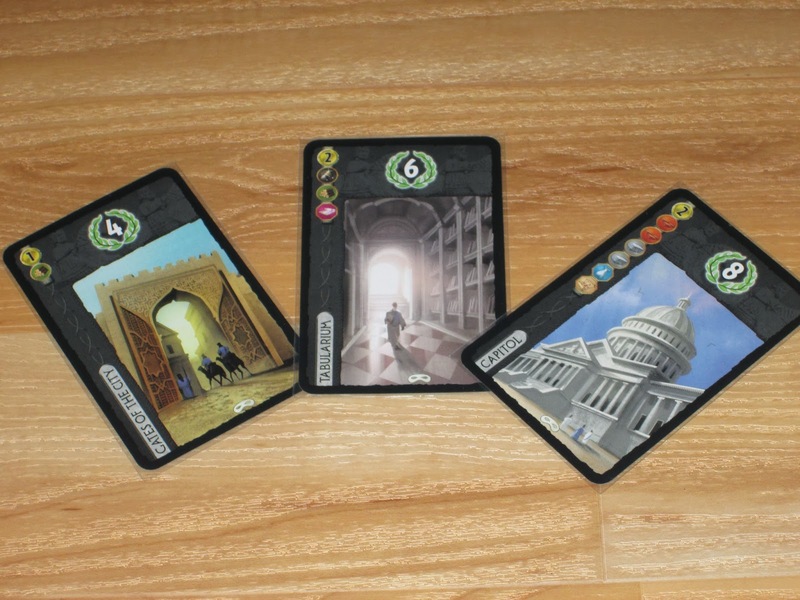 When playing with Cities, only one black card per player is shuffled into each age deck. With nine possibilities available per age, this means that players will never see every card in every game, meaning some of these new powers will not be included. There is almost a gambling element here as players hedge their bets on which cards are included and which cards can hurt them most. This unexpectedness may bother players who value complete balance. I think it’s genius, just like the guild cards. There is still enough balance for players to predict what’s coming, but the black cards add a underhanded element of subterfuge to a game that mostly lacked it. In fact, the whole expansion could be described as underhanded While Cities does not add take-that to 7 Wonders, it does add conflict–and lots of it. The conflict is more in the vein of Dominion, with most attacks affecting all players equally. The difference is that in Cities some attacks will hurt some players more than others, and it’s easy to see at a glance which players will be hurt the most (unlike Dominion, where players’ hands are secret). Is there a player keeping his or her coffers empty? It may be an opportune time to play a card that forces others to discard coins. Are you and your neighbor ignoring military strength in a tacit truce? Sit this age out and let that neighbor fight your warmongering one. So while the attacks aren’t targeted most of the time in the sense that players choose whom to hurt, most black cards are played with a particular player in mind, even if most or all players suffer equally. These secret and shady cards are a most welcome addition to the game. Wait, wait: there’s another 8 point-building?! The best part about Cities is that it’s very easy to integrate into the base game, even with new players. Most of the symbols are the same, and after one or two games of the base cards, players generally catch on to enough strategy to understand the value of the black cards. The black cards are such a simple, elegant way to completely change the game while keeping the flow of the game decidedly in line with 7 Wonders. Cities also supports up to eight players through the team rules. When I first read the team rules, I was a skeptic. But really, you need to try them. They add an even stronger element of strategy to the game, and it’s fun to discuss hands with a partner (though they may turn your trade secrets against you in the next game!). I think the team rules are a blast (although be advised that they do lengthen the game somewhat). Your patents are useless to you! The new wonders, Petra and Byzantium, are interesting, albeit not that exciting. (Petra’s great need for money is fun to watch, though.) 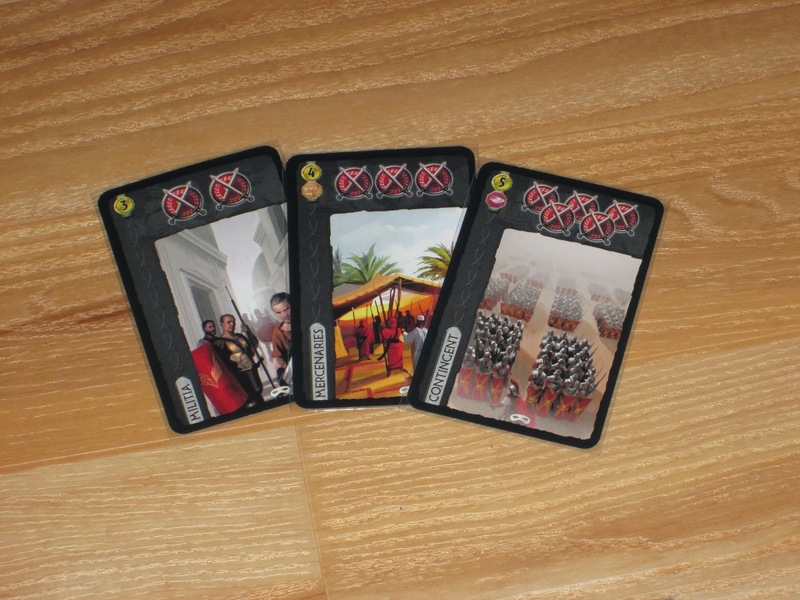 They work well with the base game, but they are not as noticeably awesome as Rome (from Leaders). The new guild cards are fun, and not all of them refer to the black cards, so some of them can be mixed in with the base game even if the city cards are not. The new leaders balance out the addition of the black cards when you combine the two expansions. As I mentioned in the Leaders review, Leaders works better for experienced players; Cities can go either way. My favorite way to play (which unfortunately does not happen often) is mixing the base game with both Cities and Leaders. But Cities is usually the one I push for regardless. Money, money, money: it’s a rich man’s world. The only thing I can say against Cities is that I wish debt featured more in the game. I suppose it acts as a strong deterrent (most players now will not dare to play without any coins), but I don’t see players take on debt often. It seems a little too avoidable. (Although I love the targeted loss cards–ones that force players with lots of military victories under their belts or stages of their wonders built to lose coins.) Then again, I’m not sure how debt could be integrated more fully into the game without imbalancing it. New leaders, too. This expansion has a little of everything. Cities is an excellent, excellent addition to 7 Wonders. 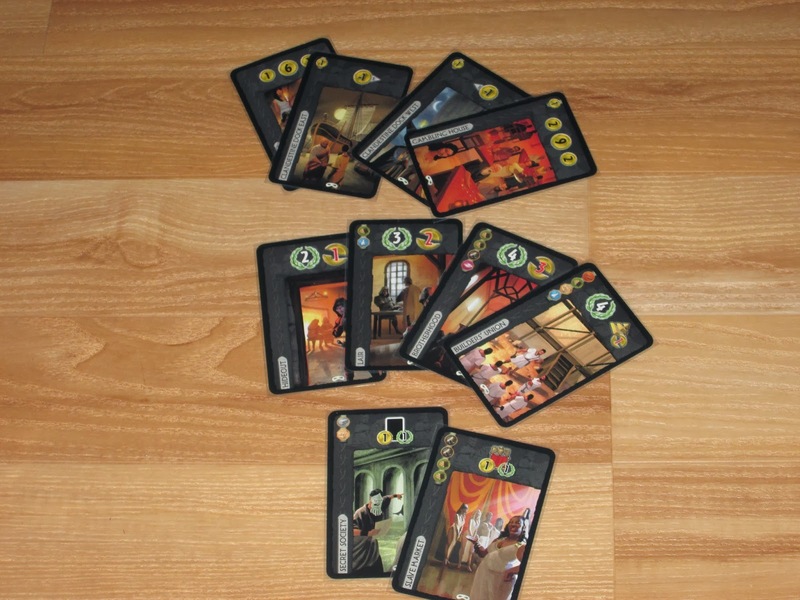 7 Wonders works well without it, but after including it, it’s hard to go back. There’s not much in the box–27 black cards, a few leader and guild cards, and some assorted tokens and wonders–but the expansion changes the game in a huge way. The team rules are great fun and allow more players at the table should you have a larger group. 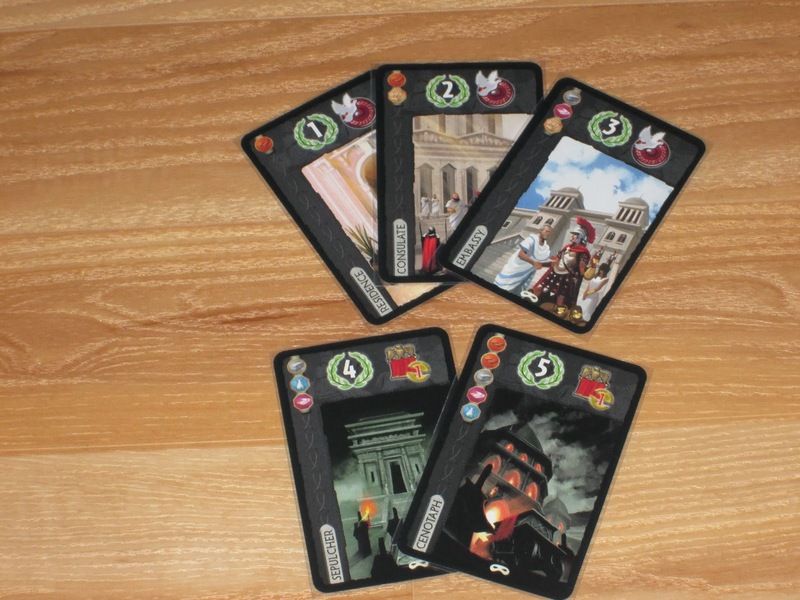 All told, Cities is about as close to a necessary expansion as 7 Wonders is likely to get. If you want to add a little uncertainty, a little sneakiness, a little conflict to your peaceful card drafting, Cities is the right expansion for you. I wasn’t going to buy any 7 Wonders expansions, because i play with my family mostly and they don’t like too much complexity. But now I’m sorely tempted to pickup Cities because it sounds like its more fun for me and still digestible to them. Yeah, it’s pretty easy to integrate, and I love the sneakiness of it. And team rules are kind of a blast. I’ve also found this to be the crowd pleaser expansion, I would highly recommend it to anyone that has gotten good mileage out of the base game. I still prefer Leaders between the 2 but given the choice to only buy one of them I would likely go with the one that’s going to get played which is easily Cities. You’ll likely find that debt is much more of an issue if you also play with Leaders due to the additional money sink. I believe the two expansions were designed together and then split apart so it makes sense that they would naturally give a cohesive experience when played together.